Red Kites were once common and widespread throughout Ireland but have been extinct here since c. 1790. 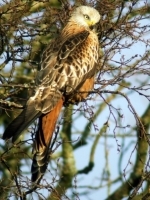 Red Kite remains have been found at a number of archaeological sites throughout Ireland. There are several old Irish names for the Red Kite, including Cúr, Préachan na gCearc or Préachán Ceirteach. Préachán Ceirteach, translates literally as the Cloth Kite. This refers to the habit of Kites decorating their nests with cloths and rags and shows that Irish people were familiar with the species in earlier centuries. Kites were driven to extinction by the end of the 18th Century by a combination of deforestation, trapping and shooting. This was part of a general trend at the time to kill all our large birds of prey, which were wrongly seen as a threat. Today, because of centuries of bird of prey persecution, Ireland has the lowest range of predatory birds in Europe.